The women’s basketball team enters the season trying to replace departed leaders in center Jasmine Stone and guard LaKeisha Eaddy. With senior leaders LaKeisha Eaddy and Jasmine Stone no longer with the women’s basketball team, coach Tonya Cardoza will need to rely on a mix of returning talent and fresh faces to replicate the team’s 2009-10 season success. While Eaddy, the program’s all-time steals leader, and Stone, last season’s leading rebounder, used up their eligibility, junior forward Kristen McCarthy and senior guard Qwedia Wallace return from a team that went 25-9 and advanced to the second round of the NCAA Tournament. The Owls also advanced to the Atlantic Ten Conference championship game, where they lost to Xavier, 57-55. With McCarthy and Wallace holding down two of the guard/forward positions, Temple should have plenty of production from the backcourt. Cardoza said the main issue the Owls will need to overcome is production in the paint. ANNA ZHILKOVA TTN Junior guard BJ Williams dribbles the ball at practice. 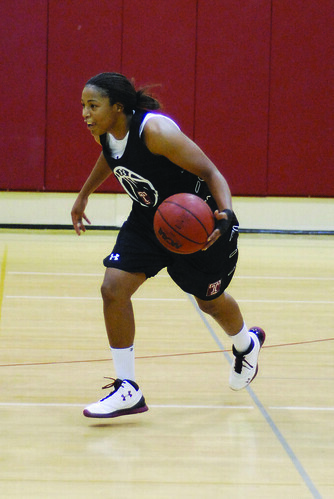 Williams is competing with junior guard Shey Peddy to be the starting point guard. Cardoza will likely look to sophomore Victoria Macaulay and junior forward Brittany Lewis, a transfer from Virginia Tech, to replace some of Stone’s scoring. Even though sophomore forward Natasha Thames will grab her fair share of rebounds, Cardoza said, Macaulay must improve in that department as well. The Owls will also need to replace Eaddy’s presence. As a player, Eaddy helped run the offense. As a person, she helped lead last year’s squad. On the court, junior guards BJ Williams and Shey Peddy will both compete for the starting point guard position. In terms of leadership, Cardoza said the Owls would rely on a variety of sources. Despite many players taking on leadership roles, senior forward Marli Bennett said the team is still relatively young and will need to overcome that. Last season, McCarthy, the undeniable star of this squad, averaged 14.8 points per game en route to being named to the First Team All-Atlantic Ten squad. Despite McCarthy’s prior success, Cardoza said the California native needs to develop additional diversity in her game in order to take the next step. The Owls have a difficult out-of-conference schedule this season, which is highlighted by visits from No. 7 Ohio State and No. 5 Xavier along with trips to No. 6 Duke and No. 16 UCLA. The Owls last faced a ranked team during the second round of the NCAA tournament against Connecticut, where they lost to the Huskies, 90-36. Despite the loss, Cardoza said the team managed to gain some perspective from the game. The Owls open up their season against the Buckeyes on Nov. 12 at 5 p.m. as part of a doubleheader with the men’s basketball team. The men’s and women’s teams’ showcased their squads and had also little bit of fun. The Owls, who reached the NCAA tournament last season, have six freshmen and eight players who haven’t played in a game for Temple.